*Disclosure: I was provided product for the purpose of this review as well as product to giveaway. The views and opinions expressed are all my own. Like many people I am trying to live greener. Most days with two children and a forgetful husband I find that hard. I feel like we still have a lot of stuff and lot of garbage (although hubby says, for full disclosure, our recycling bin is always 2-3times more full than our garbage can). So when I got the e-mail from Business to Blogger that included the snackTAXI campaign I jumped at the chance. I invented snackTAXIs way back in 2003 as a way to stem the tide of plastic ziplock bags that flowed from our house to the landfill when our 3 kids started school! We pack over 500 lunches every year, and had definitely fallen prey to the easy appeal of the ziplock bag. snackTAXIs are easy too- really! They are made in our home-based workshop by talented (and fun!) local sewers- we are committed to keeping our business local, and will never outsource our labor. The exterior of a snackTAXI is comprised of 100% cotton. The manufacturer from which we order most of our cotton has had their material tested and found that it is free of lead and phthalates. We are considering ordering all of our cotton from this manufacturer in the future. SnackTAXIs are lined with a waterproof material that consists of nylon with a polyurethane coating. After talking to many manufacturers of this product, we understand that this type of coated nylon is free of heavy metals and phthalates. We have found a supplier of this coated nylon who has had their product extensively tested. The tests revealed that the nylon is free of heavy metals (including lead), phthalates, PBBs, and PBDEs. The first item I opened was the produce sack. I have been eyeing these all around the web. I was even thinking of making my own after seeing some tutorials on them. We go through a lot of fruit in my house, so we end up with a lot of plastic bags in the produce drawer. Since I had already done my shopping for the week I didn't get a chance to take it to the store. I did use it to keep my peaches and plums separate from the other fruit in our drawer. I really liked it. It seemed the keep the fruit fresher, it didn't collect moisture like plastic bags can, and most importantly it got my kids attention. They knew that they wanted fruit out of "the red bag". I'm going to try putting vegetables in it next to see if it gets the same reaction! I currently don't have kids in full day school and my husband comes home most days for lunch so I couldn't try the sandwich sack out on an actual sandwich. I tried to convince my hubby to take it to work one day and it was a no go. My biggest concern was because we use such fresh (bakery) bread that the bread would get a little crispy or dried out with out the ziplock/ air tightness. My kids however did use them for snacks and they loved it! I am sure the novelty will wear off eventually but they had fun passing the bag back and forth while we did our errands. I used the smaller snack sack to pack a peanut butter bagel for my youngest child when we were out and about to see if the sack would reattain the smell. My son dislikes peanut butter so much that I knew if the sack retained any smell he would never use it. I washed the sack in my sink with just a sponge and all the peanut butter and peanut butter smell came off. I was impressed by how well it held up under water. I have had bibs that were supposed to be wipe clean that took on a smell and dirty hue to the edges. The last items was the cloth napkin. I really liked this it was well constructed with two fun patterns. It's also a great size for kids. I have several sets of cloth napkins from our pre-baby life that we pull out for parties. I have tried to start using them a couple of times but the kids weren't into it and didn't understand, and they are a little big for toddlers to try to maneuver. The snackTAXI Twice as Nice Napkin is a perfect size without folding for little toddler hands. My daughter (almost 3) carried it around and used it for every meal for three days. She even cried when her brother touched her "mommy napkin" so I had to pull out one of my cloth napkins for him to use. It was finally done in by a peanut butter explosion (if you couldn't figure from the title of my blog, we eat a lot of peanut butter). It washed up just fine in the washing machine and has reclaimed it rightful spot by her plate. Overall what I really liked about it was that we were using less bags, and the fun pops of color look much better in my purse then a pile of plastic bags. They bags are very well constructed and look like the will handle a lot of use. The only concerns I have is how fresh stuff would stay in them. I also don't think my local grocer would be too thrilled with me using the produce bags at the actual store since they are not see through. I see frazzled clerks getting upset that they have to dig through the bags to find the produce codes. I will be taking them to the farmers market for sure! You can buy your own snackTAXIs online or at select locations around the country click here for locations. Or you can WIN one right here! 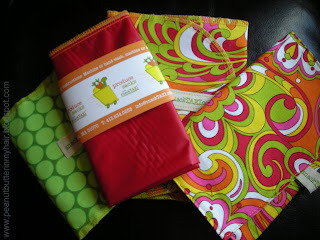 Erin from snackTaxi provided me with one Twice as Nice Napkin and one Snack Sack for one of my readers! Leave a comment on this post telling me how you and your family try to reduce plastic bag use, or which snackTAXI print you like best. Become a fan of snackTaxi on Facebook. Open to residents of the U.S. and Canada. Please be sure you include your email address in your comment if it's not in your profile so I have a way to contact you if you are the winner. Winner will be chosen using random.org. If the winner does not respond within 48 hours of being contacted a new winner will be drawn. Drawing will take place at 9:00pm (CST) on Thursday March 18th. Great idea for a giveaway!! Our family only uses reusable bags for shopping trips, but these would be great to cut back on the plastic ziploc bags for snacking! I love the Spring Bunny print--such fun for this time of year!! I follow SnackTaxi on FB! I know we probably shouldn't use plastic bags when grocery shopping, but we still have been. However, we use those as trash bags. We definitely would love using these to avoid using so many bags for lunches! Great giveaway! I pack a lunch every day and get tired of throwing away zipped bags...love your idea. I have been using my Trader Joe's reusable bag A LOT! It's heavenly. How cute! I'd love to have these for my son next year, when he's in kindergarten! Since I have 3 kids with me all the time, we tend to just bring a whole box of a snack with us, instead of even bothering to put it into plastic bags. Not as convenient, but at least we always have enough! We also use reusable grocery bags, and if we do get plastic, we try to reuse them (doggie waste) or recycle them when appropriate. Almost 3 years ago I made the switch to re-usable grocery bags. I love it - and just recently was able to get my mom to start doing the same. Its so much easier to carry a few canvas totes into the house as opposed to 15 - 20 of those plastic bags. And, since I bring my lunch to work with me just about every day - it would be nice to have something like this to use instead of plastic bags. I tried using the smaller storage containers, but they can be such a hassle and so bulky that I stopped using them. Those are very cute, and mushrooms! my favorite. Thanks for the great review and thanks for writing, I love your blog! container, that way it doesn't get smushed. However these don't always make it home. She fell in love with the "horsing around" pattern, so I know she'd keep track of that. Think I'll be investing in some. I would love this since I take a lunch every day! I currently take my lunch in a plastic bag, but I bring the same plastic bag home every day. I even use the plastic bag to carry home the milk that I've pumped that day! These remind me a lot of the "wet" bags that I used when I was cloth diapering, which I did exclusively for about three years (and loved it). I always had a wet bag with me and took it to and from my daycare provider's. 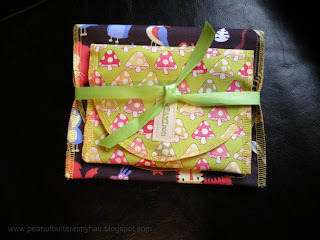 If there is one thing that becomes addictive in cloth diapering, it's all the fun and beautiful fabrics used for the diapers and all of the accessories! I might have to get some of these, this is right up our alley - thanks for bringing it to my attention! I just love these! I try to cut back on plastic bags by using reusable shopping bags and putting the kids sandwiches in tupperware sandwich containers. Great giveaway! I try to use little Tupperware containers instead of Ziploc bags. But they get bulky. I also use reusable grocery bags and when I do get the plastic sacks I recycle those for dog waste or stinky diapers. We use our re-usable bags from Thriftway to go shopping. No more plastic bags if we can help it. We take our reuseable bags to each and every store we visit...we DO NOT use plastic bags. I love the name of your blog....takes me back when my three sons were younger, I'm a granddaughter now of a 3 year old girl name Carley.